☆FOR FREE DELIVERY ORDER SHOULD BE MORE THAN 15000YEN. 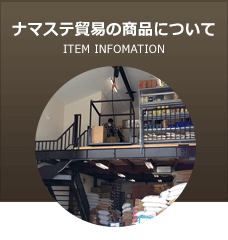 ☆IF THE ORDER RECEIVE BEFORE 4 O`CLOCK, IT WILL DISPATCHED SAME DAY. ☆IF THERE IS ANY PROBLEM REGARDING TO QUALITY OR ORDERED QUANTITY, PLEASE INFORM US WITH IN WEEK, AFTER THAT WE ARE NOT RESPONSIBLE. Copyright (c)2017 Namaste boueki Co.,Ltd. All Rights Reserved.